Super Hexagon. There, I said it. Since Terry Cavanagh’s dark thumb mangler you can’t make a geometry-based infinite runner without the comparison, regardless of what might have come before. But I can at least qualify it somewhat. Super Hexagon in 3D. Does adding an extra dimension add to the fun? We’ll see. 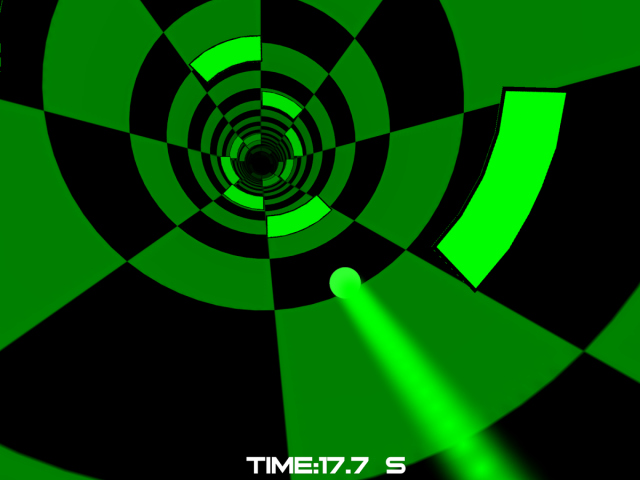 Spheroid Cyclone puts you in the shoes of a small sphere hurtling down the inside of a tunnel moving left and right to avoid obstacles. Metaphorical shoes anyway. Sphere’s after all not being known for their feet. It’s different enough to stand on its own. Roll. Sphere’s not… come on, you get the idea. The game is undeniably fun, ate my commute this morning and left me wanting more. So keep that in mind as I spend the next few paragraphs complaining. It’s a solid, enjoyable game and just a few tweaks could make it a great one. It’s the little things. The fact that it has a scoreboard, but one that scrolls very slowly and doesn’t automatically show you your ranking on it when you inevitably die. It seems like there’s only one track to the music. Even just one more would mix things up a little. It’s the kinematics. The moments when Super Hexagon was at its best was when it forced you to pull off a grand sweeping manoeuvre, circling the screen in a way that left you tingling with excitement as you slipped through to temporary freedom. You can’t do that in Cyclone. When he was designing Super Hexagon Terry Cavanagh made a decision that – for me at least – defined the feel of the game. You only die when you run head-first into something. Bumping into things sideways is harmless and is exactly what lets you get away with those crazy manoeuvres. In Cyclone you die if you touch an obstacle at any point, front or side, and that changes the mechanics drastically. There are points in the game where you’re obviously expected to loop around the screen following a trail of offset obstacles but that just means you’re more likely to run into the side of something and die. Instead it is far more reliable to stay at the bottom and just jink between blocks one after the other. Much less rewarding. It’s the big thing. Because you spend so much time focussed on the near ground making minute adjustments to slip between obstacles it’s almost impossible to keep enough attention on the far distance, meaning you only notice the really big obstacles – those that take up more than half the circumference of the tunnel – until it’s far, far too late to get into position. And it feels unfair. One design decision leads to a change in play style which leads to a shortening of reaction times which leads to unavoidable deaths, which feel unfair. Such a small thing and it’s an unfortunate blot on what is otherwise a smoothly addictive game that absolutely presses that “on more game” button. All that aside, I know what I’m doing on the train tomorrow. And for less than a pound you should be doing exactly the same.